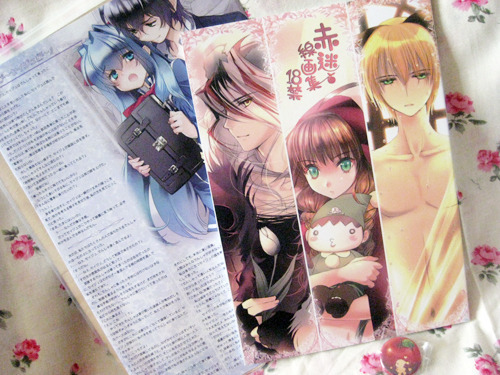 Exclusive get from C81 …and I’m yanking this off my tumblr and this is an Akazukin post anyways. Out of alllll the drama CDs I’ve heard (excluding BL CDs, I mean the type of ones where the speaker is talking to ‘you’) this is the most WTF, awkward, and really disturbing CD I’ve heard. And I have the forgiving attitude like crazy on a lot of things, this is one thing I just can’t find appealing one bit – unless you’re a Ishida fan. The premise of this CD is basically “I Love Pet” CDs but reversed. Instead of you having this magical special pet that can transform into a human (abit that’s a little weird on it’s own since they’re techincally an animal) – this series has YOU as the pet while a seiyuu cuddles and loves you to death. Summary: You play as an OL, and one day your friend Koume invites you to sign up with her to this Marriage Website. Since you’re both feeling pressure from peers and whatnot – you decide to go and meet other people who you might potentionally marry. Long time no see again! No real excuses, besides the fact that I’m lazy to write up reviews. I still do play – but I don’t play everyone’s routes xD so I can’t really put reviews out for games I’ve finished. Too damn lazy to write up lengthy spoilers unless I love the character to death. Currently for the past months, seiyuu and drama CDs has been my main though – since it’s easier to keep through with then sitting down relaxed and playing an otoge. Really hoping that game is a hit since I just loveee the system and style of the game, so should be exciting! And Azusa’s fancy figure came out a couple weeks ago – so hopefully those of you who ordered him also got him 8D Super nice painting, although I’m pretty sad that he isn’t in a more spectacular sort of pose.